We are tracking a moderate impact snowstorm for northern Wisconsin starting overnight tonight and lasting into Saturday morning. We've named this storm "Bear" #wsBear for historical purposes. This system will have many faces to it; from the snow in the north, to freezing rain potential in the central/south, and rain/rumbles of thunder in the south/southeast. This storm is going to be fun and interesting! 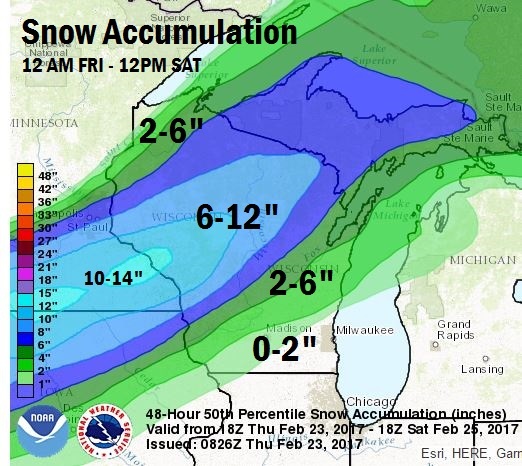 6-12" of snow is expected across northern Wisconsin. The heaviest snow right now looks to fall from Eau Claire to Iron Mountain. Some uncertainty remains about how this system will translate east-ward across the state. Snow amounts could exceed 12" in the far west near the Mississippi river. The majority of snow will fall Friday afternoon through Saturday morning on the wrap-around as the storm system pulls away. I think everyone sees snow by mid-day Saturday, but only the only real impact across the north. Preliminary ice accumulation map. This may change as we get more information. Concerns and uncertainty around where and how much freezing rain may fall during the day on Friday. This will depend on surface temperatures and a narrow layer of warm air at around 800mb. Conservative forecasts suggest generally less than 0.10" of ice accretion in southern/portions of central Wisconsin, but high-end estimates are up to 0.5"(NAM). We're on thin ice here. Broad-brushing impacts right now, essentially hanging back for more information. Take a rubber band (relaxed), put it over your index fingers, and pull your hands apart. If you pull hard enough it just might snap. This forecast is that rubber band. I'm concerned about ice accumulation during the day Friday but ground temperatures are warm. You could argue either way and feel this is a wait-and-see. QPF decreases from west to east across the state. I wonder how much of this has to do with occlusion or diversion (t-storms across Indiana)? Which aspect of this system is going to bust first? A surface low track through Chicago usually means heavy snow across central Wisconsin. We know the forecast will go wrong somewhere and I'm trying to stay ahead of that. 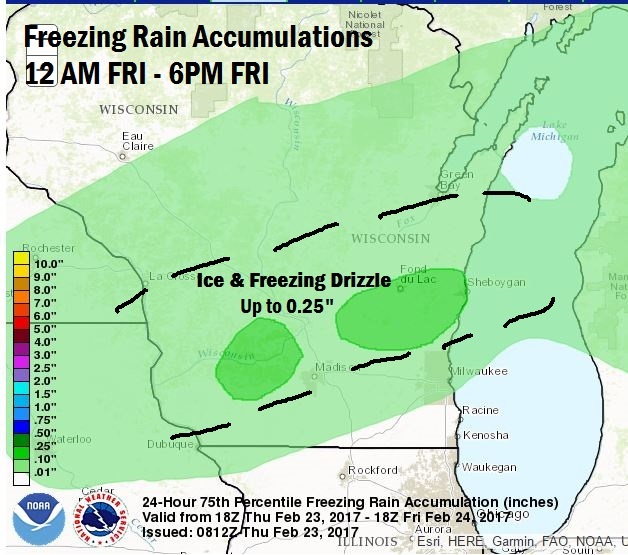 What precipitation type and how much will east-central Wisconsin get? We know this is likely to be a mixture. Is this where the biggest forecast bust will occur? Or will the bust be across northeast Wisconsin?